Another one of the great people I talked to while at GenCon was John Cadice, creative director and owner of Soda Pop Miniatures. He was kind enough to talk to me about the latest expansion for Super Dungeon Explore and of course, Relic Knights. Starting off with Super Dungeon Explore, John explained that Caverns of Roxxor is a 1st level expansion for SDE. It brings new heroes, bosses and monsters to the game, allowing players to explore more into the Dragon Back Peaks. The main baddie for the expansion is an Earth/Fire elemental (great if he's your friend and you want to make some s'mores. But bad if you want to try and take his loot). The expansion brings 3 new heroes to the game: The Starguild Sapper, Princess Ruby and the Deeproot Scout. All of them adding new and unique abilities to the game. With those 3, the total comes up to 9 heroes for the game. When asked about the origins of SDE, John explained that what Soda Pop was wanting to make was a game that explored the nostalgia of old 8-bit video games. He talked about how most of them were fun and light-hearted and didn't even take themselves too seriously. 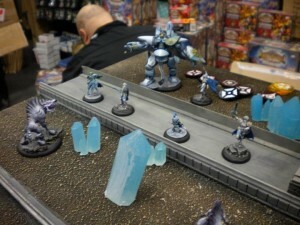 It was bringing that to the tabletop that inspired the design for the game. The game's draw brings in both old and new gamers. Older gamers remember the sorts of games SDE is parodying. Young gamers will be drawn to the cartoony-feel and easy play of the game. It really is meant for young, old, boys and girls alike. That brought the conversation up to the really hot topic of the time. Relic Knights. John was very excited to talk about the game. He has been absolutely blown away by the response that the gaming community is having to the game. Up on Kickstarter, the project was funded in only 3 hours. With that and the stretch goals, the quality is only getting better and better. I got to hold some of the models and I can say that the quality does show. It's good, strong plastic that didn't bend easily (I didn't test them /too/ hard, though. I didn't want to be the first guy to break one). Talking about the funding event, itself, John feels the keys to success were having a detailed plan for the campaign right away. This echoes much of what Mike McVey said about his campaign as well. Show off what you have and give people the knowledge that this is a project they can really get behind and not just an idea. Having regular updates was also important to have people coming back regularly to the project. The game itself, like their other projects, stems from trying to make sure they don't take themselves too seriously. The models go from walking battle-bots with huge weapons to fluffy bunnies. The style was chosen on purpose just for the reason to show that this can be fun. The game runs off of a card-based system instead of dice. There have been several card-based games showing up lately. John explained that the reason was to eliminate as much math as possible from the actual playing experience. You don't have to roll dice and figure out what's going on from that. You know as soon as you play your power cards for your ability, it is going to work. It's open and apparent at all times what is going on in the game. 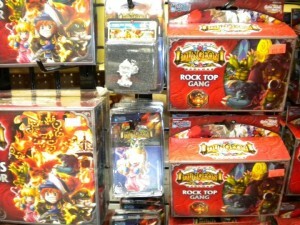 This helps bridge the gap between minis gamers and CCG gamers, as it is sort of a CCG-mentality in a TTG-body. It's also something that helps make Relic Knights stand apart from the rest. John explained that Soda Pop is really about the 3 guys that are partners in the company. Their goal is to make great, fun games with unique formats. They pay homage to many different genres, but never just outright take and copy what others have done.